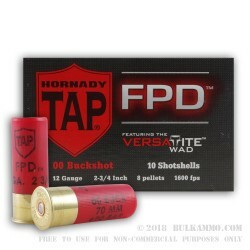 An ultra-premium home defense round from Hornady that utilizes the TAP line and the FPD designation. 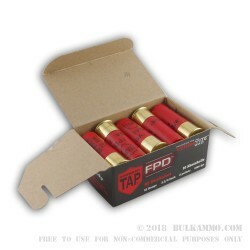 This is a 250 round case lot of the ammunition which features a fast moving 8 pellet payload of #00 Buckshot in a standard 2 ¾” shell. 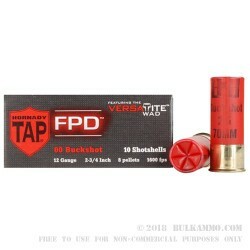 The 1600 feet per second velocity is significant for the amount of pellets contained and the patterning of the round is designed to make a very significant wound channel for immediate stopping power. 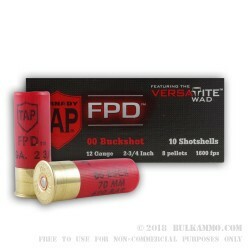 With the speed and payload this is a round that is intended for maximum threat stopping power and it does have some potency beyond what most standard loads are offering. This is an exceptionally well built round and is proven effective by law enforcement agencies all over the United States through their use of the round in many patrol cars. The effective range is wide open, and the capabilities of the round are not hampered by anything. This does pose an additional penetration concern for those in close proximity to the target. The load is certainly powerful enough to have a potential for overpenetration. The goal, however, and something that it does well, is stopping threats where they stand.